This little guy looks like a cutie. Until you learn that he could have been over 4 feet long. They were typically only 5 to 9 inches though. 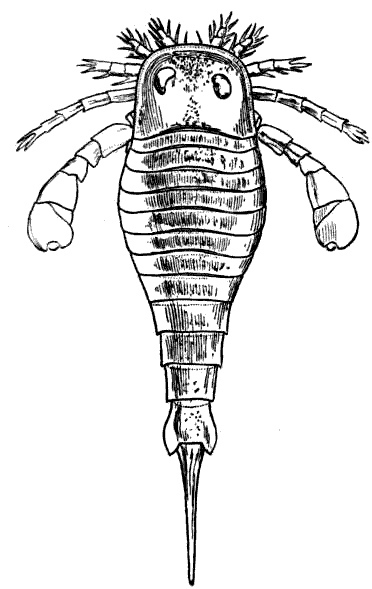 The Eurypterus was a genus of sea scorpions that are now extinct. This sea scorpion drawing makes these sea creatures almost look charming. He looks a bit like something you might find in a children’s book. Can’t you just picture the two-fisted hero, or villain, hopping along on his tail as his hairs bounce up and down? He looks a bit similar to scorpions but he looks a bit more like something someone would have dreamt up rather than a creature that lived at least 418 million years ago. These fellows have been found, in fossilized form, in the Eastern United States and some areas in Europe. Most of them were found in New York. Over 95% of all known eurypterid fossils are of this genus. Whether you are looking for fossil drawings, sea life or sea scorpion drawings; this no-so-little fellow might be just what you need.